Dr. Nafeez Mosaddeq Ahmed is the Executive Director of the Institute for Policy Research and Development (IPRD). It is an independent, non-profit transdisciplinary research network promoting equality, sustainability and security. The IPRD (www.iprd.org.uk) analyses violent conflict in the context of global economic, ecological and energy crises. He is a bestselling author and international security analyst, specializing in the historical sociology & political ecology of mass violence. Currently focusing on the intersection of global ecological, energy and economic crises, and their linkages with terrorism and state-militarization. His blog is available here, and his latest book and film are available here. Nafeez was very influential to me over the years. Thank you for this wonderful review. A bitter dose of heartfelt rationality in a field muddied by conspiracy industry dimwits. Jon Gold’s ‘9/11 Truther’ is a must-read for a number of reasons. On the one hand, I hate the title. Although I’ve done my part in challenging the official narrative around 9/11 and international terrorism for the last decade, I’ve never been a great fan of the language of the ‘truth movement’, which, to me, smacks of an almost religious, cult-like sensibility. And I’ve been increasingly perturbed by the proliferation of ridiculous theories masquerading as activism, much of which has simply served to distract from the hard task of challenging power. In particular, I’ve been revolted by the conspiracy theory industry itself that has grown up around the 9/11 question, generating endless proportions of speculative nonsense which obscures the task of holding the 1% to account in pursuit of progressive social transformation for more just, equal and sustainable communities, while generating profits for the proponents of these theories. But that’s what makes Jon’s book, with its annoying title, so appealing. Because he confronts all of this, right from the start. 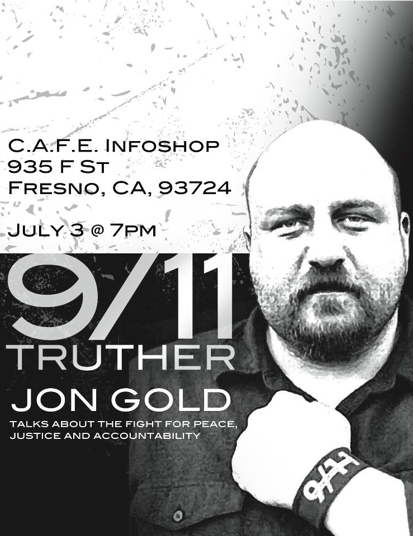 Jon Gold is an unabashed 9/11 Truther. But he hates the conspiracy theory industry as much as anyone, has been witch-hunted by a variety of fanatically deranged self-styled ‘Troofers’, and writes passionately about the 9/11 issue not as the be-all and end-all of activism, but as a critical issue which opens up fundamental questions about politics and society today. The book opens with Jon’s own story, and it’s a really heart-wrenching, inspiring narrative of a young man, an average American, a typical 99 percenter, faced with the troubles that so many face in a society that is crumbling under the weight of lack of opportunity, inequality and corrupt government. And we learn how Jon has struggled to overcome his problems, and moreover, how the anomalies and questions around the almost total collapse of the US national security complex that facilitated 9/11 and the events leading up to these horrendous, world-shaking terrorist atrocities, changed Jon. From a man demoralised by the pressures of living in the rat race of modern capitalism, Jon finds within himself a new spirit, inspired by the extraordinary struggles of the 9/11 Jersey Girls to demand answers from a Bush administration keen to close the book without accountability. And thus begins a story of Jon’s journey into the 9/11 movement. Throughout, though, we find the crucial distinction between that minority of people who cling fast to an ethic of rigour, fact-checking, constant questioning, and persistent self-criticism; compared to an unfortunate majority who jump to kneejerk conclusions, indulge in rampant and unverifiable speculation, and perpetually pass judgement on others who disagree with them. His books sets out not only a map of the most salient and verifiable facts and anomalies around 9/11 and the official narrative, based on solid checkable data, but also catalogues how his refusal to endorse any particular conspiracy theory of 9/11 led to several face-offs with certain individuals who, shall we say, ended up exposing how morally compromised and intellectually challenged they really are. Some of these dialogues are fascinating, and for anyone interested in studying the ‘truth movement’ as a sociological phenomenon, will find interesting first-hand information here on the conflicts and diversity therein. But more importantly, we learn a few lessons about what real activism is all about. Unlike his detractors – accusing him invariably of being a “Zionist”, a “state agent”, among other silly accusations which say more about the people making them than Jon himself – Jon’s approach is simple. Check the facts, ask questions, demand accountability, support those doing the same, defend the 9/11 families, remember the victims, recognise the bigger picture, remain engaged in wider social campaigns. From this, we learn that activism is very much about being the change we want to see in the world. If we want to create a world free of violence and war, we need to look at our own ethic. Do we accuse others without evidence? Do we conjecture absurd unverifiable theories and then use them to level unproveable slanders at others? Do we indulge in hysteric personal ad hominem assaults on people we barely know? Do we harbour personal grudges for years, if not decades, for no good reason other than our egos have been fundamentally challenged? If so, then we’re not part of the solution, no matter what we believe, or what ‘truth’ we think everyone else should believe in order to be considered ‘worthy’. We’re very much part of the problem, part of the system of self-aggrandizement and egoistic acquisition that has led to the world we see around us, led to events like 9/11. Jon’s inspiring journey shows us that there’s another way, dignified, and based on real, personal integrity. And because of that, his book offers us a powerful guidebook to people not familiar with these issues, to get a firsthand insight into why asking questions about state-narratives of terrorism remains ever more critical over a decade after 9/11, and most of all, to grasp the difference between asking with inner sincerity and lashing out due to inner fragmentation. Thanks Jon, for taking the time to share with us your journey; and bon voyage!